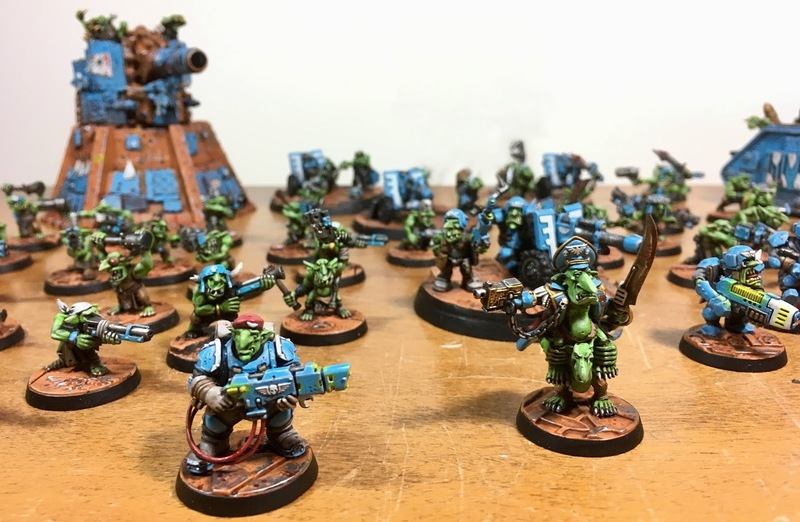 I have been woefully behind in posting my progress pictures for my latest project, a small force of Astra Militarum "counts as" goblins, but I am here to report the project is well under way at almost one third completed after less than four months since the first test model. 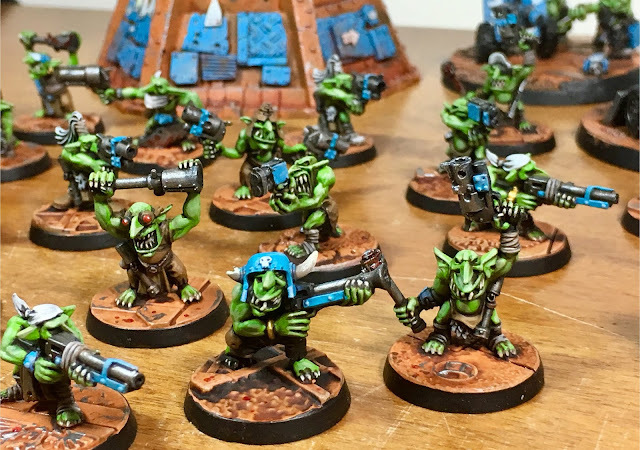 With the bulk of the miniatures being basic super fast to paint grots (representing conscripts) it was easy to spend a little more time on the conversions while speed painting the rest of the force. The "big idea" for this army arose when the new goblin Blood Bowl team was released in 2017, as I thought them a perfect candidate for converting into Cadian soldiers using parts from my bits box. 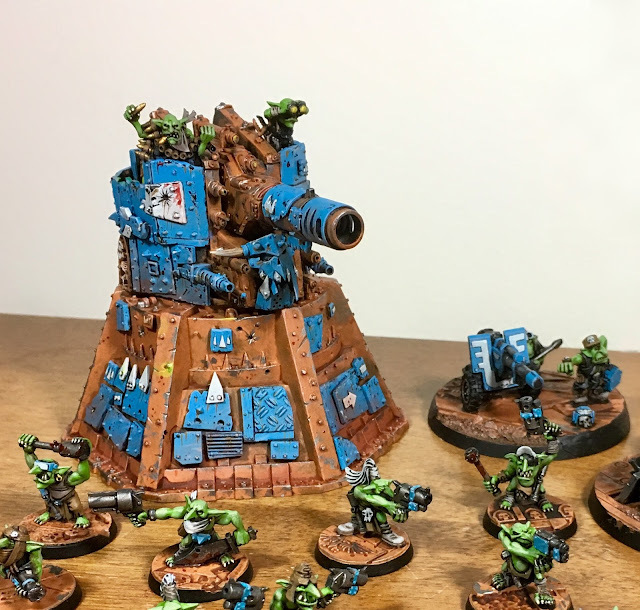 Combined with the Looted Wagons which had not seen any love in five years or more, it seemed the perfect way to create a unique army quickly and inexpensively given I already had an Ork colour scheme I knew and loved already. 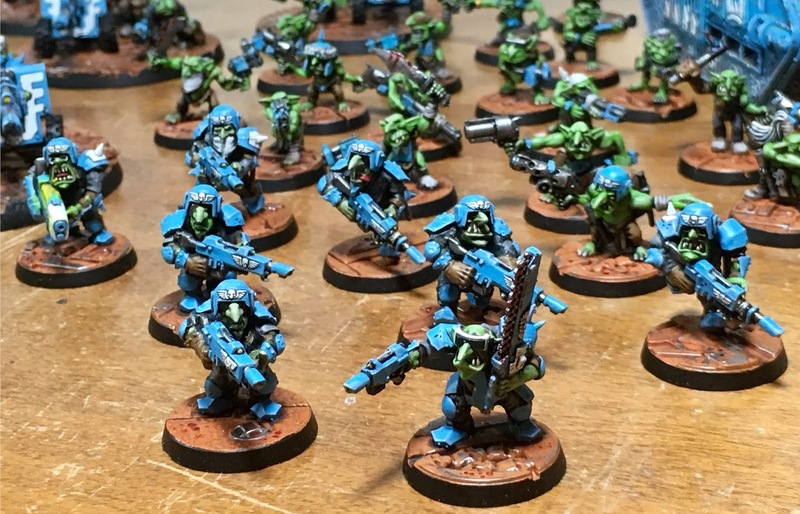 I took the rather garish Temple Guard Blue from my Orks and replaced it with Lothern blue, a reasonable match should I use units across the two armies (Heavy Weapon Teams as kannons and so on...) but quite de-saturated which I felt suited the more military nature of the Astra Militarum models. 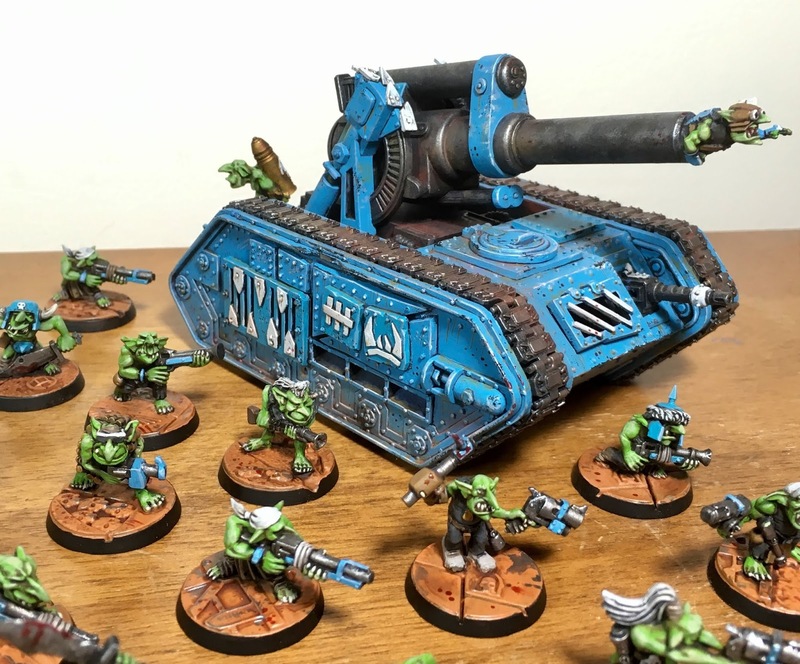 Of course, most of these tanks had been previously looted and parts were missing, but I am doing my best to keep them subtly converted with the long term view of playing them using the loyalist codex and minimal "counts as" explanations necessary. The real standout models so far have been my Lord Commissar (see this post for more photos) and my first conversion of a Tempestus Scion using some Arkanaut Company models from the Age of Sigmar range. 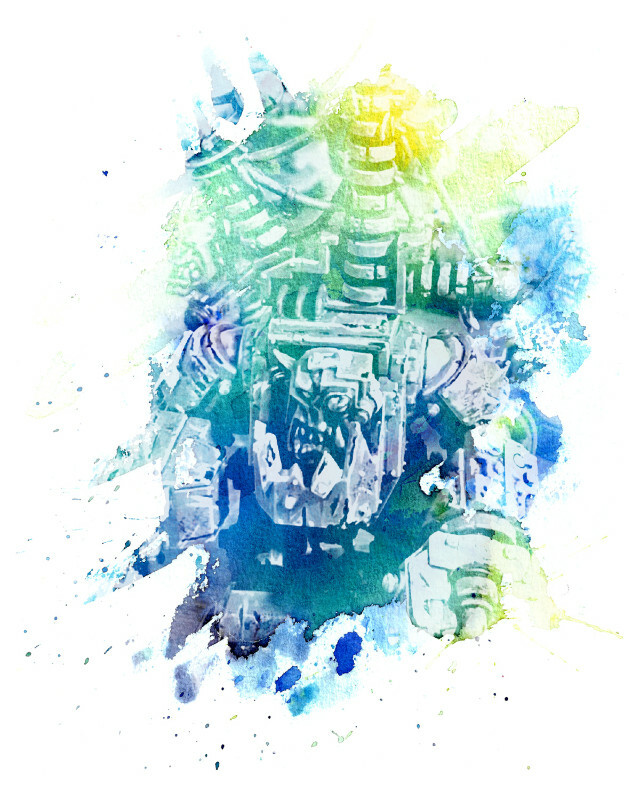 I like the model so much I am saving any further conversions as a reward for rebuilding and painting three Leman Russ tanks from my bits box (which in itself is a reward for getting to the 500 point mark as once they are completed I will be at 1000 points and a second HQ choice from a playable army). I like to tell myself it has been a great use of the delayed gratification tactic to get this far, but honestly all the units have been fun to build and paint! 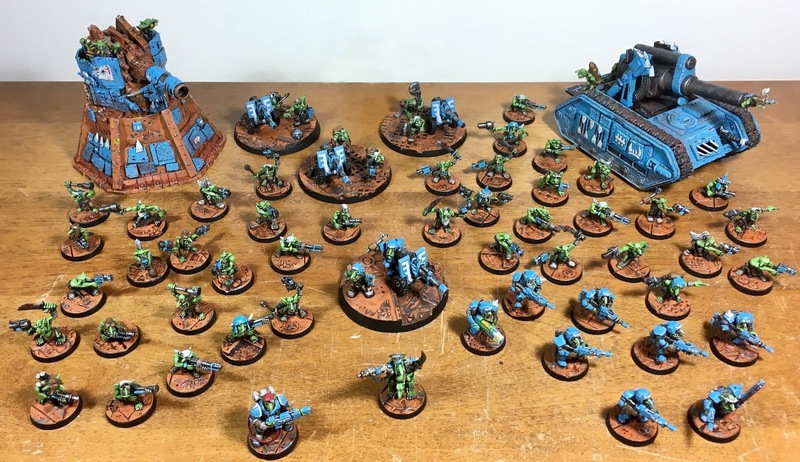 The whole force is still crammed into my bookshelf away from tiny hands while I renovate an old carry case, and I almost want to set up a display case, but the real reward will be getting them out for a game and hopefully tripling the amount of points by the time Armies on Parade rolls around in another three months. Great little force. Lord Commissar & Scion are fantastic. Such a brilliant force. Love the bright colour scheme. Outstanding! I really dig 'em! Thanks for the feedback everyone! I’m really enjoying this project, haven’t felt this good about a hobby project in years.